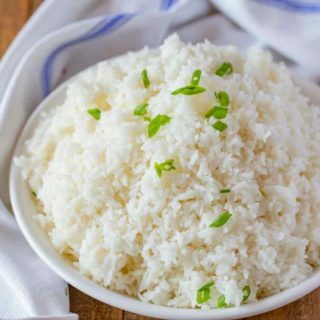 Chinese Steamed Rice is incredibly easy to make on your stovetop, and the PERFECT side to serve with just about any recipe! Rinse the rice several times until the water is clear and most of the starch is gone then add the rice and water to a pot and bring to a boil letting it boil until almost all the water on the surface is gone and you can see between the grains of rice. Cover and reduce to a simmer (very low heat) for 15 minutes, do not fluff rice, it will disturb the stickiness.